In studying our Solar System over the course of many centuries, astronomers learned a great deal about the types of planets that exist in our universe. This knowledge has since expanded thanks to the discovery of extrasolar planets, many of which are similar to what we have observed here at home. For example, while hundreds of gas giants of varying size have been detected (which are easier to detect because of their size), numerous planets have also been spotted that are similar to Earth – aka. “Earth-like”. These are what is known as terrestrial planets, a designation which says a lot about a planet how it came to be. Also known as a telluric or rocky planet, a terrestrial planet is a celestial body that is composed primarily of silicate rocks or metals and has a solid surface. This distinguishes them from gas giants, which are primarily composed of gases like hydrogen and helium, water, and some heavier elements in various states. The term terrestrial planet is derived from the Latin “Terra” (i.e. Earth). Terrestrial planets are therefore those that are “Earth-like”, meaning they are similar in structure and composition to planet Earth. All terrestrial planets have approximately the same type of structure: a central metallic core composed of mostly iron, with a surrounding silicate mantle. Such planets have common surface features, which include canyons, craters, mountains, volcanoes, and other similar structures, depending on the presence of water and tectonic activity. Terrestrial planets also have secondary atmospheres, which are generated through volcanism or comet impacts. This also differentiates them from gas giants, where the planetary atmospheres are primary and were captured directly from the original solar nebula. Terrestrial planets are also known for having few or no moons. Venus and Mercury have no moons, while Earth has only the one (the Moon). Mars has two satellites, Phobos and Deimos, but these are more akin to large asteroids than actual moons. Unlike the gas giants, terrestrial planets also have no planetary ring systems. All those planets found within the Inner Solar System – Mercury, Venus, Earth and Mars – are examples of terrestrial planets. Each are composed primarily of silicate rock and metal, which is differentiated between a dense, metallic core and a silicate mantle. The Moon is similar, but has a much smaller iron core. Io and Europa are also satellites that have internal structures similar to that of terrestrial planets. In the case of the former, models of the moon’s composition suggest that the mantle is composed primarily of silicate rock and iron, which surrounds a core of iron and iron sulphide. Europa, on the other hand, is believed to have an iron core that is surrounded by an outer layer of water. Dwarf planets, like Ceres and Pluto, and other large asteroids are similar to terrestrial planets in the fact that they do have a solid surface. However, they differ in that they are, on average, composed of more icy materials than rock. Most of the planets detected outside of the Solar System have been gas giants, owing to the fact that they are easier to spot. However, since 2005, hundreds of potentially terrestrial extrasolar planets have been found – mainly by the Kepler space mission. Most of these have been what is known as “super-Earths” (i.e. planets with masses between Earth’s and Neptune’s). Examples of extrasolar terrestrial planets include Gliese 876 d, a planet that has a mass 7 to 9 times that of Earth. This planet orbits the red dwarf Gliese 876, which is located approximately 15 light years from Earth. The existence of three (or possibly four) terrestrial exoplanets was also confirmed between 2007 and 2010 in the Gliese 581 system, another red dwarf roughly 20 light years from Earth. The smallest of these, Gliese 581 e, is only about 1.9 Earth masses, but orbits very close to the star. Two others, Gliese 581 c and Gliese 581 d, as well as a proposed fourth planet (Gliese 581 g) are more-massive super-Earths orbiting in or close to the habitable zone of the star. If true, this could mean that these worlds are potentially habitable Earth-like planets. The first confirmed terrestrial exoplanet, Kepler-10b – a planet with between 3 and 4 Earth masses and located some 460 light years from Earth – was found in 2011 by the Kepler space mission. In that same year, the Kepler Space Observatory team released a list of 1235 extrasolar planet candidates, including six that were “Earth-size” or “super-Earth-size” (i.e. less than 2 Earth radii) and which were located within their stars’ habitable zones. Since then, Kepler has discovered hundreds of planets ranging from Moon-sized to super-Earths, with many more candidates in this size range. As of January, 2013, 2740 planet candidates have been discovered. Scientists have proposed several categories for classifying terrestrial planets. Silicate planets are the standard type of terrestrial planet seen in the Solar System, which are composed primarily of a silicon-based rocky mantle and a metallic (iron) core. Iron planets are a theoretical type of terrestrial planet that consists almost entirely of iron and therefore has a greater density and a smaller radius than other terrestrial planets of comparable mass. Planets of this type are believed to form in the high-temperature regions close to a star, and where the protoplanetary disk is rich in iron. Mercury is possible example, which formed close to our Sun and has a metallic core equal to 60–70% of its planetary mass. Coreless planets are another theoretical type of terrestrial planet, one that consists of silicate rock but has no metallic core. In other words, coreless planets are the opposite of an iron planet. Coreless planets are believed to form farther from the star where volatile oxidizing material is more common. Though the Solar System has no coreless planets, chondrite asteroids and meteorites are common. And then there are Carbon planets (aka. “diamond planets”), a theoretical class of planets that are composed of a metal core surrounded by primarily carbon-based minerals. Again, the Solar System has no planets that fit this description, but has an abundance of carbonaceous asteroids. Until recently, everything scientists knew about planets – which included how they form and the different types that exist – came from studying our own Solar System. But with the explosion that has taken place in exoplanet discovery in the past decade, what we know about planets has grown significantly. For one, we have come to understand that the size and scale of planets is greater than previously thought. What’s more, we’ve seen for the first time that many planets similar to Earth (which could also include being habitable) do in fact exist in other Solar Systems. Who knows what we will find once we have the option of sending probes and manned missions to other terrestrial planets? Universe Today has articles on smallest terrestrial exoplanet and gas planets. For the latest information on confirmed extrasolar planets, be sure to check out the Kepler’s Planet Candidates. For a full list of all confirmed and potential planets, consult the Extrasolar Planet Encyclopaedia. Astronomy Cast has episodes on the terrestrial planets including Mars, and an interview with Darin Ragozzine, one of the Kepler Space Mission scientists. For thousands of years, human beings have stared up at the sky and wondered about the Red Planet. Easily seen from Earth with the naked eye, ancient astronomers have charted its course across the heavens with regularity. By the 19th century, with the development of powerful enough telescopes, scientists began to observe the planet’s surface and speculate about the possibility of life existing there. However, it was not until the Space Age that research began to truly shine light on the planet’s deeper mysteries. Thanks to numerous space probes, orbiters and robot rovers, scientists have learned much about the planet’s surface, its history, and the many similarities it has to Earth. Nowhere is this more apparent than in the composition of the planet itself. Like Earth, the interior of Mars has undergone a process known as differentiation. This is where a planet, due to its physical or chemical compositions, forms into layers, with denser materials concentrated at the center and less dense materials closer to the surface. 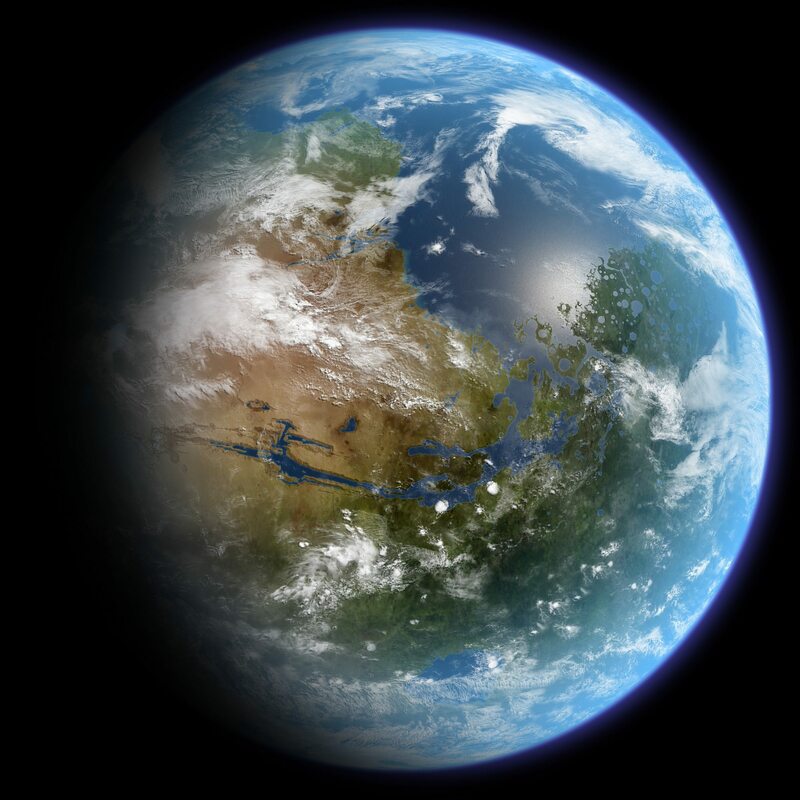 In Mars’ case, this translates to a core that is between 1700 and 1850 km (1050 – 1150 mi) in radius and composed primarily of iron, nickel and sulfur. This core is surrounded by a silicate mantle that clearly experienced tectonic and volcanic activity in the past, but which now appears to be dormant. Besides silicon and oxygen, the most abundant elements in the Martian crust are iron, magnesium, aluminum, calcium, and potassium. Oxidation of the iron dust is what gives the surface its reddish hue. Despite there being no magnetic field at present, there is evidence that Mars had a magnetic field at one time. According to data obtained by the Mars Global Surveyor, parts of the planet’s crust have been magnetized in the past. It also found evidence that would suggest that this magnetic field underwent polar reversals. This observed paleomagnetism of minerals found on the Martian surface has properties that are similar to magnetic fields detected on some of Earth’s ocean floors. These findings led to a re-examination of a theory that was originally proposed in 1999 which postulated that Mars experienced plate tectonic activity four billion years ago. This activity has since ceased to function, causing the planet’s magnetic field to fade away. Much like the core, the mantle is also dormant, with no tectonic plate action to reshape the surface or assist in removing carbon from the atmosphere. 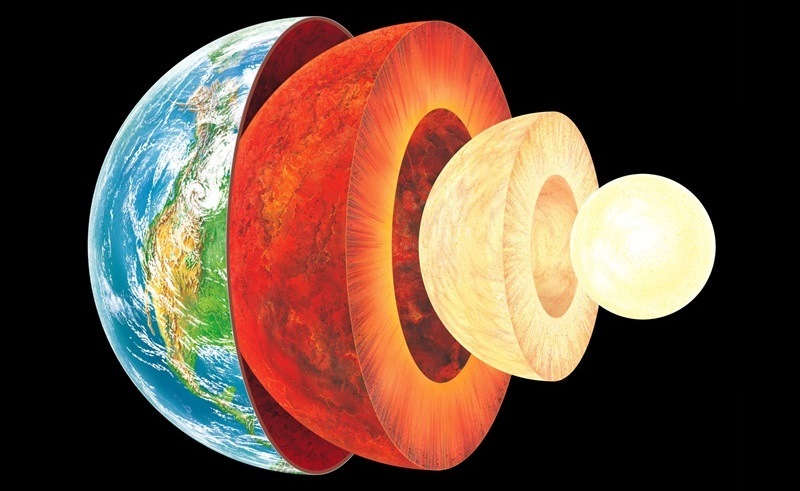 The average thickness of the planet’s crust is about 50 km (31 mi), with a maximum thickness of 125 km (78 mi). By contrast, Earth’s crust averages 40 km (25 mi) and is only one third as thick as Mars’s, relative to the sizes of the two planets. The crust is mainly basalt from the volcanic activity that occurred billions of years ago. Given the lightness of the dust and the high speed of the Martian winds, features on the surface can be obliterated in a relatively short time frame. Much of Mars’ composition is attributed to its position relative to the Sun. Elements with comparatively low boiling points, such as chlorine, phosphorus, and sulphur, are much more common on Mars than Earth. Scientists believe that these elements were probably removed from areas closer to the Sun by the young star’s energetic solar wind. After its formation, Mars, like all the planets in the Solar System, was subjected to the so-called “Late Heavy Bombardment.” About 60% of the surface of Mars shows a record of impacts from that era, whereas much of the remaining surface is probably underlain by immense impact basins caused by those events. These craters are so well preserved because of the slow rate of erosion that happens on Mars. Hellas Planitia, also called the Hellas impact basin, is the largest crater on Mars. Its circumference is approximately 2,300 kilometers, and it is nine kilometers deep. The largest impact event on Mars is believed to have occurred in the northern hemisphere. This area, known as the North Polar Basin, measures some 10,600 km by 8,500 km, or roughly four times larger than the Moon’s South Pole – Aitken basin, the largest impact crater yet discovered. Though not yet confirmed to be an impact event, the current theory is that this basin was created when a Pluto-sized body collided with Mars about four billion years ago. This is thought to have been responsible for the Martian hemispheric dichotomy and created the smooth Borealis basin that now covers 40% of the planet. Scientists are currently unclear on whether or not a huge impact may be responsible for the core and tectonic activity having become dormant. The InSight Lander, which is planned for 2018, is expected to shed some light on this and other mysteries – using a seismometer to better constrain the models of the interior. Other theories claim that Mars lower mass and chemical composition caused it to cool more rapidly than Earth. This cooling process is therefore believed to be what arrested convection within the planet’s outer core, thus causing its magnetic field to disappear. Mars also has discernible gullies and channels on its surface, and many scientists believe that liquid water used to flow through them. By comparing them to similar features on Earth, it is believed these were were at least partially formed by water erosion. Some of these channels are quite large, reaching 2,000 kilometers in length and 100 kilometers in width. Yes, Mars is much like Earth in many respects. It’s a rocky planet, has a crust, mantle, and core, and is composed of roughly the same elements. As our exploration of the Red Planet continues, we are learning more and more about its history and evolution. Someday, we may find ourselves settling on that rock, and relying on its similarities to create a “backup location” for humanity. We have many interesting articles on the subject of Mars here at Universe Today. 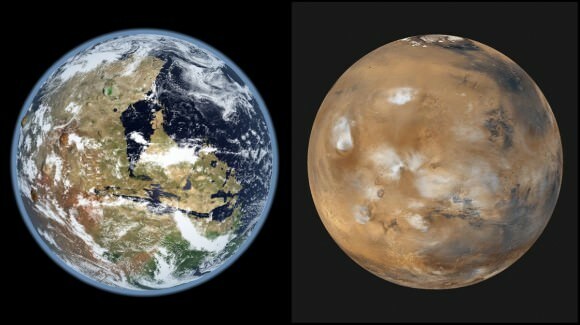 Here’s How Long Does it Take to Get to Mars?, How Far is Mars from Earth?, How Strong is the Gravity on Mars?, What is the Weather like on Mars?, The Orbit of Mars. 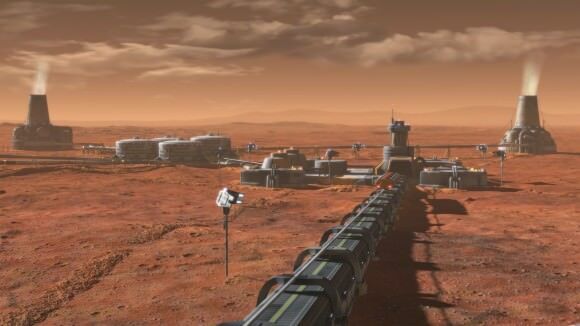 How Long is a Year on Mars?, How Do We Colonize Mars?, and How Do We Terraform Mars? Ask a Scientist answered the question about the composition of Mars, and here’s some general information about Mars from Nine Planets. NASA – What is Mars?